Bust 34", Waist 26", Hips 36"
1960, 60s Mad Men, Retro Afternoon Clothing Patterns - Dress with double breasted bodice and easy six gore skirt. 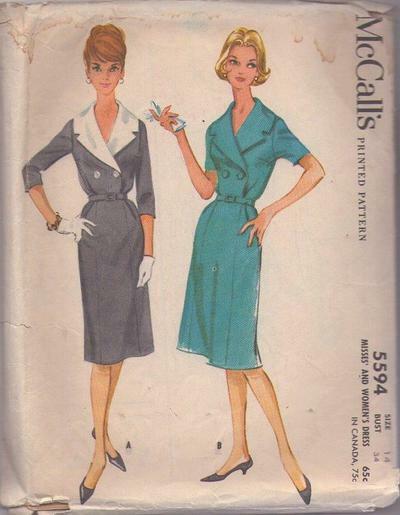 Notched shawl collar of dress fabric, cut in one with bodice fronts, is faced and interfaced. Optional contrast, detachable over collar. Short or three quarter length set in sleeves. Inverted pleat in waist side front and side back, soft fold in skirt side front, dart at side back. Left side zipper placket.